I bought TP-LINK AV500 wifi Powerline extender starter kits, including one TL-PA4010 and two TL-WPA4220. The best part of this solution is to extend the network as far as power line covers, and wifi clone. The setup should be as easy as the following diagram and several button pressing. Lucky we can do it hard way, which guarantee success. We need TP-LINK Powerline Scan tool (find in the product CD or this link). We then plug all powerline devices into wall sockets. We need at least one Ethernet cable. 1) Add two TL-WPA4220 to TL-PA4010’s network. Connect laptop to any TL-WPA4220 using Ethernet cable. Use the Powerline Scan tool to find and connect to the device. Login user and password are both ‘admin’. In the page, write down ‘Device Password’ and ‘Mac Address’. Find the info for the two TL-WPA4220. Then connect to TL-PA4010 using Ethernet cable. Use the Powerline Scan tool to find and connect to the device. Login user and password are both ‘admin’. Click ‘Powerline’ -> ‘Station Setting’ in the left side menu. On the right side main page, click ‘Add New…’, enter a TL-WPA4220’s Device Password, and any Device Name. And we are done adding TL-WPA4220 to TL-PA4010’s network. 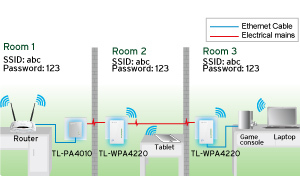 Use Ethernet cable to connect to TL-WPA4220. In the admin website, Click ‘Wireless’ -> ‘Wireless Setting’, edit SSID the same as home wifi SSID. ‘Wireless’ -> ‘Wireless Security’ to set the same authentication method and login password. Reboot the device to save the settings. Then we are done to set TL-WPA4220 to clone home wifi. That’s it. I now have strong wifi signal in garden.